Door County’s newest waterfront wedding and event venue is here to make all your dreams come true! However you envision your perfect day – romantic, vintage, elegant, casual, intimate, cottage-y, rustic, or a one-of-a-kind fairytale in a gorgeous setting as unique as you are – the historic Hillside Inn of Ephraim, the newest Midwest destination wedding venue in beautiful Door County, Wisconsin, will make it unforgettable! IMAGINE exchanging your vows on a low bluff overlooking the sparkling waters of Eagle Harbor, in the charmingly scenic Village of Ephraim (nicknamed the Cape Cod of the Midwest)! 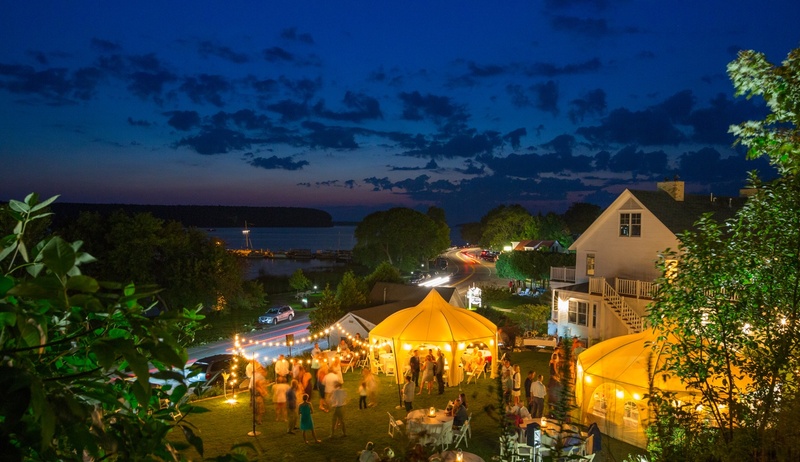 IMAGINE dancing outdoors under the stars or under a twinkling, lighted tent, as your guests enjoy one of Door County’s famously magical sunsets. IMAGINE lovely shorefront gardens, bay view porches and charming white-painted vintage structures as the perfect backdrop for your inspired wedding photos. Whatever your event – engagement party, rehearsal dinner, wedding, reception, anniversaries, reunions, retreats, birthday parties, etc – from ten to one hundred – The Hillside Inn of Door County will make your dreams come true! Contact us at 920-854-7666 to view the property and discuss how we can help you create the wedding or event of your dreams!